In a somewhat unusual season opener for both squads, Marlette rolled to an easy 67-26 win over Peck last week. While the score wasn’t the unusual part, the game clock was. The two teams agreed to play two 16 minute halves rather than the traditional eight minute quarters. The Red Raiders, loaded with experience and solid overall team speed raced out to a big lead, scoring on every kind of shot, inside and out, including a two-handed dunk by Andrew Storm. Marlette grabbed a commanding 37-10 advantage at the intermission and piled on another 30 points in the second half to coast to the victory. Marlette shot 60% from the floor in field goals and made only 2 of 23 three point tries. They were a dismal 30% from the floor, converting 3 of 10 attempts. Marcus Armstrong led the scoring with 15 points and had seven rebounds. Storm finished the game with 14 points and had eight rebounds while Hunter Kelly and Barrett George scored 10 apiece. No individual Peck results were made available. 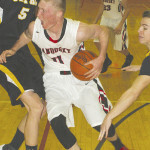 The Red Raiders returned to action Wednesday night, colliding with Vassar of the Tri-Valley conference.